Abu Jafar al-Ma'mun ibn Harun (also spelled Almamon and el-Mâmoûn) (September 14, 786 - August 9, 833) (المأمون) was the seventh Abbasid caliph who reigned from 813 until his death in 833. He had been designated by his father, Harun al-Rashid to succeed his brother al-Amin although this did not happen without bloodshed. When al-Amin tried to by-pass him by appointing his own son, he rebelled, defeated al-Amin, and claimed the caliphate. When, in a bid to reunify the Muslim world, he nominated the leader of the Shi'a community as successor, he faced a rebellion by his uncle. He faced other uprisings and conflict with the Byzantine Empire but the caliphate also expanded during his reign. Subdueing Afghanistan and consolidating his authority elsewhere, Al-Mamun is renowned for his patronage of learning, commissioning translations of classical Greek texts. He founded the famous 'Bayt al-Hikmah' (House of Wisdom} in Baghdad and personally presided over discussions on logical, theological, and legal matters. It was during his caliphate that Sunni jurisprudence took shape. On the negative side, he imposed a creed on his subjects, penalizing dissenters. This creed, which differed from Sunni orthodoxy and his continued sympathy for Shi'a Muslims, alienated many. Yet his court was tolerant of the other monotheistic faiths, whose followers participated fully in the thriving and often innovative intellectual life over which he presided. His rule, despite persecution of those who disagreed with his creed, is generally said to have been just and moderate. It could be claimed that the type of fruitful inter-religious and intellectual exchange for which Andalusia has rightly attracted attention as an example of harmony, flourished earlier at his court. This challenges the contention, argued by some, that Islam and other belief-systems cannot co-exist but that encounter between them inevitable results in confrontation and conflict. In 802, Harun al-Rashid, father of al-Ma'mun and al-Amin, ordered that al-Amin succeed him and that al-Ma'mun serve as governor of Khurasan and as caliph after the death of al-Amin. Al-Ma'mun was reportedly the older of the two brothers, but his mother was a Persian woman while al-Amin's mother was a member of the reigning Abbasid family. After al-Rashid's death in 809, the relationship between the two brothers deteriorated. In response to al-Ma'mun's moves toward independence, al-Amin declared his own son Musa as his heir. This violation of al-Rashid's testament led to a civil war in which al-Ma'mun's newly recruited Khurasani troops, led by Tahir bin Husain (d. 822), defeated al-Amin's armies and laid siege to Baghdad. In 813, al-Amin was beheaded and al-Ma'mun recognized as caliph throughout the empire. There were disturbances in Iraq during the first several years of al-Ma'mun's reign, while the caliph was in Merv (provincial capital of Khorasan). On November 13, 815, Muhammad Jafar claimed the Caliphate for himself in Mecca. He was defeated and quickly abdicated asserting that he had only become caliph on news that al-Ma'mun had died. Lawlessness in Baghdad led to the formation of neighborhood watches. When in A.H. 201 (817 C.E.) 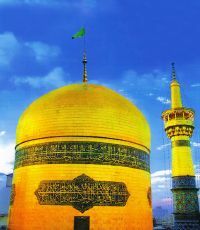 al-Ma'mun named Imam Reza the eighth Shi'a Imam and a direct descendant of Muhammad his heir, declaring that he knew of no one more suited to succeed him. He had compared members of his own Abbasid family with those of members of the descendants of Aliand "did not find among them a more excellent person than Ali ar-Rida." He then gave his daughter, Omm Habib, in marriage to the Imam. In the process, he counted the number of people belonging to his own clan so that he could award them pensions. There were 30,000. The appointment of the Imam as his heir was a political move by al-Ma'mun, since most of Persia was sympathetic to the Shi'a. It was, however, perhaps also indicative of a genuine desire to re-unify the Muslim community, one of the original aims of his dynasty. William Muir comments how, later, at his court Alide sympathies continued to be expressed so much so that the first three caliphs were "treated as usurpers". However, his opponents in Baghdad, hearing this news, gave their allegiance to his uncle, Ibrahim ibn al-Mahdi declaring his caliph. He had coins struck in the Imam's name. If the Imam had succeeded, the Abbasid dynasty would have ended although he may have expected that his grand-son might succeed. As soon as he learned about the situation in Baghdad, al-Ma'mun set out for the City of Peace on the day the fast ended, April 12, 818. At Tus, he stopped to visit his father's grave. In uprisings that broke out following the announcement that the Imam was to succeed to the caliphate, Imam Reza was assassinated. Shi'a sources blame al-Ma'mun for this while Sunni sources stress his sadness and regret. Later, he built a shrine for the slain Imam at Mashhad. Muhammad ibn Jarir al-Tabari states that al-Ma'mun entered Baghdad on August 11, 819. He wore green and had others do so. Informed that compliance with this command was despite popular opposition to the color, on August 18th he reverted to traditional Abbasid black. While Baghdad became peaceful, there were disturbances elsewhere. In A.H. 210 (825-826) Abdallah ibn Tahir secured Egypt for al-Ma'mun freeing Alexandria from Spanish adventurers and quelling unrest. The Spanish moved to Crete where al-Tabari records their descendants were still living in his day. Abdallah returned to Baghdad in 211 (826-827) bringing defeated rebels with him. Also, in 210 there was an uprising in Qum sparked by complaints about taxes. After it was quashed, the tax assessment was set significantly higher. In 212 there was an uprising in Yemen. In 214 (829-830) Abu al-Razi who had captured one Yemeni rebel was killed by another. Egypt continued to experience unrest. Sind was also rebellious until subdued by Ghassan ibn Abbad in 216 (831-832). An ongoing problem for al-Ma'mun was the uprising headed by Babak Khorramdin. In 214, Babak routed an Abbasid army killing its commander Muhammad ibn Humayd. By the time Al-Ma'mun became Caliph, animosity between the Arabs and the Byzantines had settled into constant border skirmishing, with Arab raids into Anatolia followed by Byzantine raids that "stole" Christian subjects of the Abbasid Caliphate, forcibly settled them into the Anatolian farmlands to increase the population and hence provide more farmers and more soldiers. The situation changed with the reign of Michael II in 820 C.E. Forced to deal with the rebel Thomas the Slav, Michael had few troops to spare against a small Andalusian invasion of 40 ships and 10,000 men against Crete, which fell in 824 C.E. A Byzantine counter offensive in 826 C.E. failed miserably. Worse still was the invasion of Sicily in 827 by Arabs from Tunis. Even so, Byzantine resistance in Sicily was fierce and not without success whilst the Arabs became quickly plagued by internal squabbles. That year, the Arabs were expelled from Sicily, although they were to return. In 829, Michael II died and was succeeded by his son Theophilos. Theophilos had a mixed diet of success and defeat against his Arab opponents. In 830 C.E. the Arabs returned to Sicily and after a year-long siege took Palermo from their Christian opponents and for the next 200 years they were to remain there to complete their conquest, which was never short of Christian counters. The Caliph Al-Ma'mun meanwhile launched an invasion of Anatolia in 830 C.E. Al-Ma'mun triumphed and a number of Byzantine forts were taken; he spared the surrendering Byzantines. Theophilos did not relent and in 831 captured Tarsus from the Muslims.The next year, learning Byzantines had killed some sixteen hundred people, Al-Ma'mun returned. This time some thirty forts fell to the Caliphate forces, with two Byzantine defeats in Cappadocia. This would be followed by the destruction of Melitene, Samosata and Zapetra by the vengeful Byzantine troops in 837 C.E. Theophilos wrote to Al-Ma'mun offering terms. The Caliph replied that he carefully considered the Byzantine ruler's letter, noticed it blended suggestions of peace and trade with threats of war and offered Theophilos the options of acknowledging divine unity, paying tax or fighting. Al-Ma'mun made preparations for a major campaign and died on the way while leading an expedition in Sardis. Al-Ma'mun's relations with the Byzantine Romans is marked by his efforts in the translation of Greek philosophy and science. Al-Ma'mun gathered scholars of many religions at Baghdad, whom he treated magnificently and with tolerance. He sent an emissary to the Byzantine Empire to collect the most famous manuscripts there, and had them translated into Arabic. It is said that, victorious over the Byzantine Emperor, Al-Ma'mun made a condition of peace be that the emperor hand over of a copy of the "Almagest," Ptolemy of Alexandria's famous mathematical treatise. Al-Ma'mun's record as an administrator was marked by his efforts toward the centralization of power and the certainty of succession. The Bayt al-Hikma, or House of Wisdom, was established during his reign. The ulema (religious scholars) emerged as a real force in Islamic politics during al-Ma'mun's reign for opposing the mihna, which was instituted in 827. The mihna, or "ordeal," is comparable to Medieval European inquisitions only in the sense that it involved imprisonment, a religious test, and a loyalty oath. The casualties of the Abbasid inquisition do not approach a fraction of those executed in Europe under similar circumstances. In the effort to centralize power and test the loyalty of his subjects, al-Ma'mun required elites, scholars, judges and other government officials to undergo the test, which was a series of questions relating to theology and faith. The penalty for failing the mihna could include death. The controversy over the mihna was exacerbated by al-Ma'mun's sympathy for Mu'tazili theology and other controversial views. Mu'tazili theology was deeply influenced by Aristotelian thought and Greek rationalism, and stated that matters of belief and practice should be decided by reasoning on the basis of the Qur'an. This defied the literalist position of Ahmad ibn Hanbal and others, according to which everything a believer needed to know about faith and practice was spelled out literally in the Qur'an and the Hadith. Moreover, the Mu'tazilis stated that the Qur'an was created rather than eternal, a belief that was shared by the Jahmites and Shi'a, among others, but contradicted the Sunni opinion that the Qur'an and the Divine were co-eternal. The fact that the Mu'tazili school had its foundations in the paganism of Greece further disenchanted a majority of Islamic clerics. The ulema and the major Islamic law schools became truly defined in the period of al-Ma'mun and Sunni jurisprudence became defined in parallel. Doctrinal differences between Sunni and Shi'a Islam began to become more pronounced. Ibn Hanbal, the founder of the Hanbali legal school, became famous for his opposition to the mihna. Al-Ma'mun's simultaneous opposition to and patronage of intellectuals led to the emergence of significant dialogues on both secular and religious affairs, and the Bayt al-Hikma became an important center of translation for Greek and other ancient texts into Arabic. It survived until the Mongol conquest in 1258. This Islamic renaissance spurred the rediscovery of Hellenism and ensured the survival of these texts into the European renaissance. It is said that as soon as Al-Ma'mun arrived in Baghdad he asked for a list to be drawn up of those men of learning who merited attendance at his court. He employed a large number of translators and patronized many scholars. One such scholar is regarded as the father of algebra, Al-Khwārizmī. Many had previously worked in isolation; now they were able to exchange ideas. Ma'mun himself presided over regular discussion. Topics ranged from inter-religious dialogue to the meaning of love; no subject was off-limits. He would intervene whenever "discussion threatened to give way to a brawl." He was especially interested in Euclid. It was under his patronage that the works of Plato, Aristotle, Hippocrates, and others were first translated into Arabic. Aristotle is said to have appeared to him in a dream. Harun al-Ma'mun was an ardent collector of books. The Library associated with the House of Wuisodm was the world's largest since the destruction of Alexandria Library. Shortly before his death, during a visit to Egypt in 832, the caliph ordered the breaching of the Great Pyramid of Giza looking for knowledge and treasure. He entered the pyramid by tunneling into the Great Pyramid near where tradition located the original entrance. Discovering little about the "mystery" of the Pyramid, he ordered it re-sealed but praised the "skill and wisdom of the ancients." Al-Ma'mun was interested in every aspect of science, philosophy and especially in astronomy. He himself conducted, on the plains of Mesopotamia, two astronomical operations intended to determine the value of a terrestrial degree. The crater Almanon on the Moon is named in recognition of his contributions to astronomy. His court was an hospitable place for Jews and Christians. The Apology of Al-Kindy, which Muir published in an abridged translation, is reputedly set in his court and contains a letter by the caliph. He complains of those who had converted to Islam merely to gain favor at court but said that he dealt with them "courtesy and forbearance" leaving their fate in God's hands. Christianity was the "most amenable of all religions to Islam." Muir suggests that the treatment of Islam described found in the Apology would not have been allowed except by what he called Al-Ma'mun's "latitudinarian" court. It has been suggested apart from Sunnis who did not subscribe to his theological views, almost everyone whether Muslim, Christian, Jew and Zoroastrians were welcome at his court. At Tabari recounts how Al-Ma'mun was sitting on the river bank telling those with him how splendid the water was. He asked what would go best with this water and was told a specific kind of fresh dates. Noticing supplies arriving, he asked someone check whether such dates were included. As they were, he invited those with him to enjoy the water with these dates. All who did this fell ill. Others recovered. But Al-Ma'mun died. As he was dying he spoke, expressing his belief in the unity of God and his reliance on God's mercy. He encouraged his successor to continue his policies and not burden the people with more than they could bear. This was on August 9, 833. Al-Ma'mun died near Tarsus and the city's major mosque contains a tomb reported to be his. He was succeeded by his nominated heir, his half-brother, al-Mu'tasim. It is not known why he by-passed his son, Al-Abbas who was popular with the army and the general public. However, Al-Abbas pledged allegiance to his uncle and appears to have respected his father's decision. However, he was later persuaded to rebel and eventually died in prison. Al-Ma'mun principal wife was Buran (or Khadijah), daughter of al-Hasan b. Sahl, governor of Persia in January 826, who survived him by over fifty years. Ibn Khaldūn says that he gave her a thousand rubies as her wedding gift. At her request, he pardoned his uncle, Ibrahim. They do not appear to have had children. Two sons were borne by another wife, Umm Isa whom he had married earlier, probably before his father's death. Al-Abbas was born in 837. Sources do not identify who his mother was. Ma'mun is reputed to have employed a vast number of women to report to him on the affairs of his harem, which suggests that it housed no few women. After al-Ma'mun's reign, no further Abbasid caliphs were to marry, preferring to find their heirs in the harem. He is said to have permitted mut'ah (temporary marriage), not generally allowed in Sunni law. The Abbasid empire grew somewhat during the reign of al-Ma'mun. Rebellions in Sindh were put down, and most of Afghanistan was absorbed with the surrender of the leader of Kabul. Mountainous regions of Iran were brought under a tighter grip of the central Abbasid government, as were areas of Turkestan. By fighting for and winning his own succession following his father's nomination that he should succeed his brother and by appointing his own half-brother rather than his son to succeed him, he helped to solidify the mechanism of succession. Succession of the caliphate was never strictly hereditary. On the one hand, it was retained within the family; on the other hand, it was the right of the reigning caliph to nominate which relative would succeed. This would then be ratified by the oath-taking of leading citizens. Al-Ma'mun depended less on his wazir than did many other caliphs. El-Hibri points out that while his father's reign is associated with "romance and mystery" and "placed in a mythical milieu" Al-Ma'mun's is "associated with learning and rational pursuits" and that "descriptions … have generally echoed with a far more realistic ring." He may qualify as the greatest patron of philosophy and science in the history of Islam. The presence of non-Muslims at his court and their participation in scholarly and religious exchange is evidence that, despite what some have claimed to the contrary, Islam is not inevitably destructive of the cultural life of other religions. For his reign was without question a glorious one, ushering in, as it did, the palmy days of literature, science, and philosophy. He was himself addicted to poetry, and once struck a poet with amazement who, on reciting an original piece of a hundred stanzas, found the Caliph readily "capping" every verse as he went along. At his Court were munificently entertained men of science and letters, poets, physicians, and philosophers … "
All in all, Muir concluded, Al-Ma'mun reign was "brilliant and just." To a certain extend, depictions of his reign have suffered from Culture war between Sunni and Shi'a. ↑ Tabari, and Bosworth (1987), 36. ↑ Khallikān, and Slane (1842), 212. ↑ Ibn Khaldun, Rosenthal, and Dawood (1969), 352. ↑ 8.0 8.1 Muir (1924), 504. ↑ 9.0 9.1 9.2 El-Hibri (1999), 95. ↑ 11.0 11.1 11.2 Muir (1924), 508. ↑ Muir. 1887. page 30. ↑ Tabari, and Bosworth (1987), 224-231. ↑ Ibn Khaldūn, Rosenthal, and Dawood (1969), 139. ↑ Christopher Melchert, The Formation of the Sunni Schools of Law, 9th-10th Centuries C.E. Studies in Islamic Law and Society (Leiden, NL: Brill, 1997, ISBN 9789004109520). ; El-Hibri. (1999), 97. ↑ Bat Yeʼor, Miriam Kochan, and David Littman, Islam and Dhimmitude: Where Civilizations Collide (Madison, NJ: Fairleigh Dickinson University Press, 2002, ISBN 9780838639429). ↑ Tabari, and Bosworth (1987), 231. Alizadeh, Saeed, Alireza Pahlavani, and Ali Sadrnia. 2004. Iran: A Chronological History. London: Alhoda. ISBN 9789640614136. Bahramian, Ali, Sadeq Sajjadi. 2009. "ʿAbbāsids." In Wilferd Madelung, and Farhad Daftary (eds.). Encyclopaedia Islamica. Volume 1. Leiden, NL: Brill. ISBN 9789004168602. Ibn Khaldūn, Franz Rosenthal, and N.J. Dawood. 1969. The Muqaddimah: An Introduction to History, Bollingen series. Princeton, NJ: Princeton University Press. ISBN 9780691017549. Ibn Khallikān, and William MacGuckin Slane. 1842. Ibn Khallikan's Biographical Dictionary. Paris, FR: Printed for the Oriental translation fund of Great Britain and Ireland. Kitto, John. 2003. Journal of Sacred Literature, January 1850 to April 1850. Whitefish, MT: Kessinger. ISBN 9780766155961. Muir, William. 1887. The Apology of Al Kindy, Written at the Court of Al Mâmûn (circa A.H. 215; A.D. 830), in Defense of Christianity Against Islam: With an Essay on it's Age and Authorship Read Before the Royal Asiatic Society. London, UK: SPCK. Muir, William. 1924. The Caliphate: Its Rise, Decline and Fall: From orig. sources. Edinburgh, UK: Grant. Retrieved February 22, 2009. Saeed, Alireza Pahlavani, and Ali Sadrnia. 2002. Iran: A Chronological History. London, UK: Alhoda. ISBN 9789640614136. Al-Khwārizmī, scholar at the House of Wisdom. This page was last modified on 15 February 2019, at 15:04.